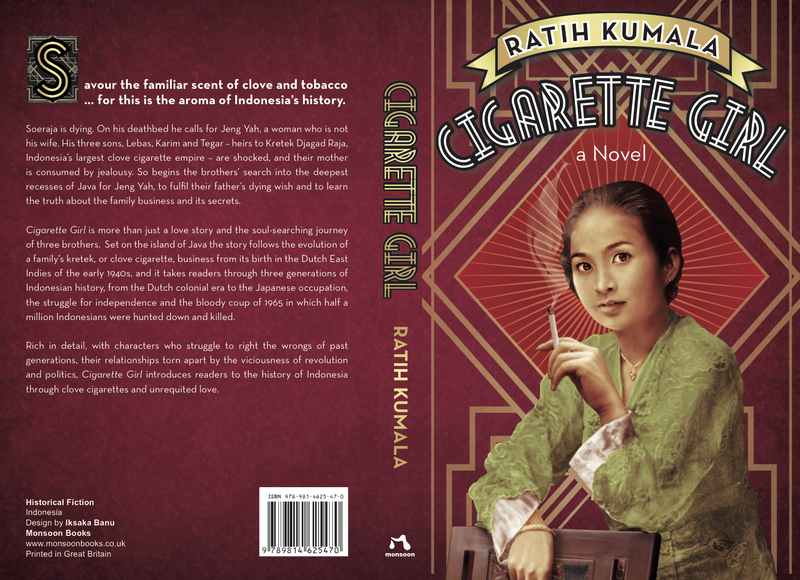 Redolent of the ubiquitous Indonesian kreteks, Cigarette Girlfollows three generations of two Javanese families from the time of the Dutch surrender to the Japanese in 1942, via the crackdown on the communists and the massacres of 1965, to the present. 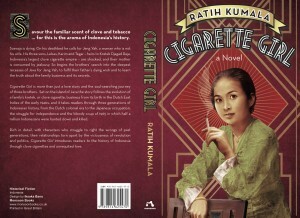 Written by Ratih Kumala (whose author husband Eka Kurniawan has already made a splash in English-language translation), Cigarette Girl has been fluently translated by Annie Tucker, who made the sensible decision to leave many terms in either Bahasa Indonesia, or in Javanese, most, although not all, with explanations in the text, adding a layer of linguistic richness and interest to an already interesting and absorbing novel. Idroes Moeria and Soedjagad are the respective patriarchs of the families: we meet them as young men just as the Dutch are leaving Java and the Japanese arriving. The men, initially friends, fall out over a woman, Roemaisa, who rejects Soedjagad and marries Idroes Moeria. The result is a bitter rivalry between the the men in all aspects of life. Both Idroes Moeria and Soedjagad start cigarette businesses. The clove-scented worlds of Indonesian cigarette manufacture and consumption provide the compelling, richly-evoked social setting for the novel. The sensual pleasure of smoking is stressed throughout; there are no health warnings here. Idroes Moeria is initially the more successful. He and Roemaisa have two daughters. As a young woman, their elder daughter, Dasiyah, the cigarette girl of the title, has an uncanny ability to roll irresistible cigarettes. In the mid-1960s, she falls in love with the itinerant Soeraja, who washes up in her hometown, and she lets him into her family’s commercial secrets. But he abandons her to marry Soedjagad’s daughter, Purwanti. Soedjagad brings Soeraja into his own cigarette business to form Djagad Raja Cigarettes, destined to become one of the leading brands in Indonesia and a source of great wealth. Much of the plot deals with secrets and discovery. When the book opens, Soeraja is on his deathbed, delirious, and arousing his wife Purwanti’s jealousy by calling for a woman, Jeng Yah. In the teeth of maternal opposition, the couple’s three sons Tegar, Karim, and Lebas set out to find this mysterious woman. What they find, in addition to Jeng Yah’s identity, if not necessarily to finding the woman herself, are long held secrets about both their father’s private life, and also about the family business. The spoiled youngest sibling is a film maker with aspirations to make high-budget movies “with real artistic and moral value.” But instead he settles for horror flicks and soap operas. Kumala, indeed, is herself presumably playing with the conventions of Indonesian soap opera through her plot, with its multi-generational twists and turns. But the plot is far from the novel’s only or even primary virtue. For readers beyond Indonesia, Cigarette Girl provides fascinating glimpses of contemporary Indonesian social attitudes, and of Indonesian folklore and folk beliefs and provides a sustained, and brave, exploration of recent Indonesian politics and history. Who will you accept: the Roem who is living with us now? Or the Roem of a month ago who was here yet still as good as gone, as if she were already dead. In the next generation, Idroes Moeria’s and Roemaisa’s daughter, Dasiyah is also separated from her beloved, by political events—she and Soeraja are forced apart just before their marriage, during the turmoil of 1965. Idroes Moeria never would have guessed that the nightmare of the Japanese occupation, the nightmare he had locked up tight inside him twenty years ago, would return to haunt him again during his twilight years. His arrest and torture in TNI custody unlocked a flood of repressed pain and bad memories. Inhale just once, and the lady of your dreams will appear before you. The cigarette for the man who loves his wife. Needless to say, My Wife Cigarettes sink without trace, while Lady Cigarettes are a great success. Once Karim has finished speaking, the reader is no longer sure if Soedjagad’s story happened like that, either. Reviewed by: Rosie Milne runs Asian Books Blog twitter@asianbooksblog. She lives in Singapore.